All project managers face problems on Monday mornings – good project managers are working on next Monday’s problems. 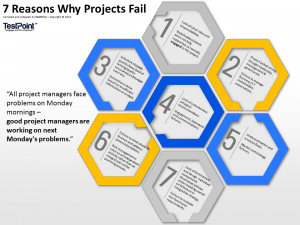 – Learn 7 common reasons why Projects Fail. 2) Project lack strong thought leadership, management & governance. Failure to manage business/I.T stakeholders expectations. 3) Schedule slippage, quality flaws (lack of testing/quality assurance) and budget overruns. Engagement, teamwork and communications failures. 5) Underestimation and analysis flaws. 6) Failure to think ahead to foresee and address potential problems. 7) Lack of architecture and design. Individual components developed without understanding overall architecture or integration strategy. Failure to consider non functional requirements.